Mestre Adelmo, Adelmo Pereira Lima, son of Anastacio Pereira da Silva and Eunice Lima da Silva, was born on the 15th of July, 1964, on the periphery of Brasilia - Guara. He studied Theology at the Faculdade de Teologia da Unificacao in Sao Paulo. His studies, some of which were self-taught, included religion, phylosophy, art, history, mythology and history of capoeira. He travelled through Brazil participating, and assisting with conferences about God, family and the prevention from AIDS. 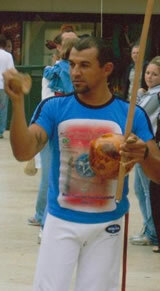 Mestre Adelmo started Capoeira at the age of 13, 25th of January 1978 in Guara - Brasilia, DF with Mestre Barto - RJ. On the 20th of November 1985, Mestre Adelmo moved from Brasilia to Sao Paulo and started Projeto Cultural Origens do Brasil. In November 2002 Mestre Adelmo received his master belt from Mestre Pombo de Ouro. This was later confirmed in the presence of over 100 Capoiera Masters in 2003 at the Congress of Capoeira by Mestre Barto (he was unable to come to the first event). He wrote "Capoeira, a Universe of Inspiration which was launched in 2010 in Bournemouth – UK, during our 6th Meeting Capoeira for Peace. In December 2010 the book was launched also in Sao Paulo – Brazil. The book is available in Brazilian Portuguese, English and soon it will be available in Croatian.